Methodism, in all its roots, has a long history celebrating and recognizing the ministry of the laity. In the early days of American Methodism, the laity served and maintained congregations between visits of the circuit riders. Today, lay people are the front line of daily ministry at the workplace, in the home and within the community. ...the third Sunday in May [is] Anniversary Day, commemorating the constitution of the Board of Lay Activities by the General Conference, the same to be designated as "Laymen's Day," and strict observance of this day by a lay program in every church, which shall set forth adequately the place of lay activities in the Church and be of inspirational value to the laymen for larger service in the kingdom. Within two years, the success of the celebration hastened to make Laymen's Day an annual observance. Once the factions of the Methodist Episcopal Church merged in 1939, the joint General Board of Lay Activities approved Laymen's Day and designated February 23, 1941, as the first United Methodist Church observance. The January issue of The Methodist Layman enthusiastically reports the aim of Laymen's Day as "...to emphasize the place that lay members have in the total life and work of the church." Laity Sunday is a time to recognize the work and mission of all laity — not only within the walls of the church but in everyday lives. Think what this could mean to the church! Forty thousand laymen — lawyers, physicians, teachers, bankers, businessmen, mechanics, farmers and others — speaking on The World Mission of the Church! The whole Methodist Church will be moved and stirred to action by such a message. ...There are vast possibilities for good in Laymen's Day. It is the prayer of the General Board that every Conference, District, Associate District, Charge and Church Lay Leader and every District Superintendent and Pastor will give wholehearted cooperation to make the day significant in the life of The Methodist Church. In October 1942 The Methodist Layman recommends the last Sunday of February "be fixed as Laymen's Day throughout the Church" and calls for "serious preparation for this day and...[for] Pastors to give active cooperation." 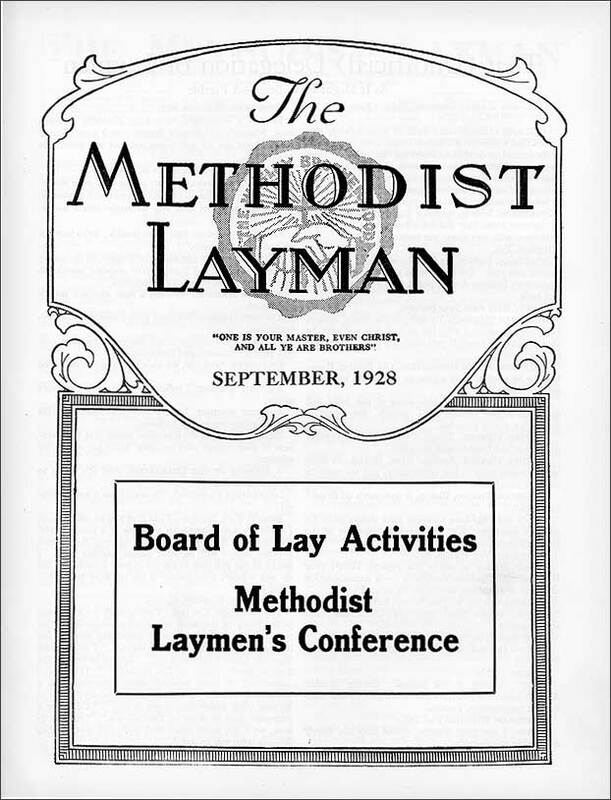 Laymen's Day is first mentioned in the 1944 Book of Discipline (¶ 1483), where its direction is placed under the auspices of the General Board of Lay Activities. …shall be to interpret the role of the laity in the world and to provide laymen with opportunity to witness to their faith in Jesus Christ and their commitment to his mission in the world. By the 1972 edition of the Book of Discipline, Laymen's Day was renamed the gender-neutral Laity Sunday (¶ 163) but was often referred to as Laity Day until 1977. See the Laity Sunday themes through history here (PDF). Today, Laity Sunday is celebrated the third Sunday of October. Quadrennial themes are set by the Association of Annual Conference Lay Leaders and approved by the board of directors of Discipleship Ministries. We need the whole Body of Christ as we seek to become more vital congregations who make disciples of Jesus Christ for the transformation of the world! What are ways that you can celebrate lay ministry more often in your congregation? How can you encourage others in their discipleship?